A new, world-class terminal complex that will completely replace the current facility is under construction at Louis Armstrong New Orleans International Airport (MSY) and will be complete by fall 2019. MSY is the primary commercial airport in the State of Louisiana serving over 80 percent of all passengers flying into the state. Armstrong International Airport is owned by the City of New Orleans. On April 17, 2013, the Airport announced its decision to move forward with a Long-Term Strategic Development Plan to construct a new terminal facility. The "Northside Alternative” was chosen as the most feasible option for a new terminal facility. After the decision was made, the plan to build a new terminal on the northside of the Airport was referred to as the North Terminal Project. 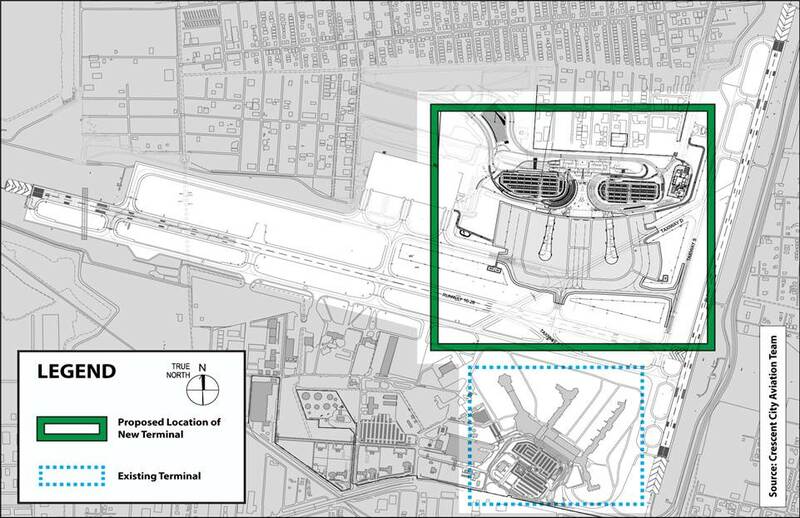 Below is a location map showing the locations of the existing terminal and the new terminal. Construction of the North Terminal Project was commemorated with a groundbreaking ceremony held on January 14, 2016. The new, world-class was designed by acclaimed architect Cesar Pelli of Pelli Clarke Pelli, Manning Architects, and the Crescent City Aviation Team, a joint venture of Leo A. Daly Company and Atkins North America, Inc. The $1.029 billion capital program includes construction of a new terminal that will replace the existing facility, enabling projects such as the airfield lighting vault relocation and FAA navigational aids relocations, construction of a storm water pumpstation, and a new on-airport roadway system. Other projects included in the capital program, which will be funded by third parties, include an aircraft fuel hydrant system, and a flyover interchange access from I-10. 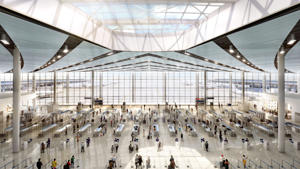 The new thirty-five (35) gate replacement terminal will improve the passenger experience with a consolidated checkpoint offering greater ease and efficiency for passengers going through security and an in-line baggage system where passengers will just drop off their checked baggage at the ticket counters. Other amenities include an attached parking garage and surface parking and concessions located down the center of the concourse to allow passengers to see their gate while enjoying a taste of New Orleans or picking up that last minute souvenir. Passengers should feel the spirit of New Orleans in the new terminal through the sights, smells, and sounds that reverberate all the best in our City. The new terminal is scheduled to open May 15, 2019. In 2013, the Airport prepared an Environmental Assessment (EA) under the National Environmental Policy Act (NEPA) for the implementation of a Long-Term Airport Development at the Louis Armstrong New Orleans International Airport. On December 30, 2013, The Federal Aviation Administration (FAA) accepted that 2013 EA as a Federal document and based its Finding of No Significant Impact (FONSI) and Record of Decision (ROD) for the Long-Term Airport Development on that EA. The 2013 EA identified the Northside Alternative as the Proposed Action and FAA’s Preferred Alternative. Since the approval of the FONSI and based on final design, the Airport made some planning and design changes. As a result, and in compliance with the National Environmental Policy Act (NEPA), the Airport prepared a Supplemental EA to discuss those changes and their environmental effects. The FAA has accepted the Final Supplemental Environmental Assessment by issuing a Finding of No Significant Impact (FONSI) and Record of Decision.